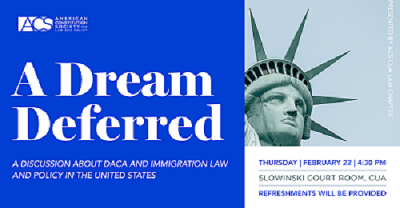 "A Dream Deferred: A Discussion about DACA and Immigration Law and Poli" by Luiz Pedrosa, Cori Alonso-Yoder et al. On February 22, 2018, the American Constitution Society for Law and Policy hosted a discussion about DACA and immigration law and policy in the United States entitled “A Dream Deferred.” The event was organized by CUA Law American Constitution Society Vice President Breck Story (3L) and moderated by Reema Ali '05. Pedrosa, Luiz; Alonso-Yoder, Cori; Lind, Dara; and Chaundry, Rabia, "A Dream Deferred: A Discussion about DACA and Immigration Law and Policy in the United States" (2018). Other Lectures & Events. 13.